Viborg's former coach, Tomas Ryde, talks to Eurohandball.com before returning to Sweden. 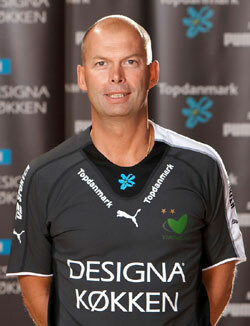 As Eurohandball.com reported earlier, Tomas Ryde will step down as head coach of Viborg HK. The Swedish coach will leave two years before his contract would expire for private reasons. In a goodbye interview Ryde – among other things – talks about the poor results of Danish women’s this season. Eurohandball.com: When looking back on your three years in Viborg, what picture do you see? Tomas Ryde: It’s been a fantastic time, although it started with difficulties. When I arrived to the club in 2005, several key players left and a period of learning began for many of the new players. We paid a price for that, not least in the Danish Cup final against GOG where we were leading by 8 goals early in the second half, but lost. However, we managed to rise and win both the Champions League and the Danish championship that season. Next season the quarterfinal against LADA Togliatti was our Waterloo. Three key players were ill the week before that match in Russia and after our defeat there we ran out of energy and could not do much against Slagelse in the finals of the Danish championship play-offs. This season we won the Danish Cup final against FCK Håndbold clearly, but we failed in the Champions League. Nevertheless, winning the Danish championship was the perfect way to end the season. Eurohandball.com: Two titles out of three this season. Good enough? Tomas Ryde: Yes, absolutely. The main reason of our failure in the CL main round was that we had many injuries. In those critical weeks we only had 12 players at the trainings and we could not prepare so well. Eurohandball.com: You were severely criticised by the media and fans after the CL exit. How does it affect you? Tomas Ryde: It does not affect me at all when criticism comes from outside as they do not know what’s going on. I evaluated our season with the club management and players and I’m content with the outcome of that. Eurohandball.com: Viborg were not the only Danish team to cause disappointment. Practically all other teams in the European Cup competitions failed. What do you think? Tomas Ryde: Again, I would think that injury was the main reason for us. Teams such as Viborg, Ikast, Aalborg and GOG have been severely hit by injuries, partly because of the great number of matches during the season. Kolding, almost free of injuries with a new philosophy this season, were the only positive surprise this year. Eurohandball.com: Are you going to stay in handball in Sweden? Tomas Ryde: I really cannot tell it yet. Certain things still have to work out the right way. However, what I’m looking forward to is becoming management consultant in Swedish industry. I’m probably going to work in handball in my spare time in one way or the other, though. As reported earlier, current assistant coach Jakob Vestergaard will be taking over as head coach after Ryde.